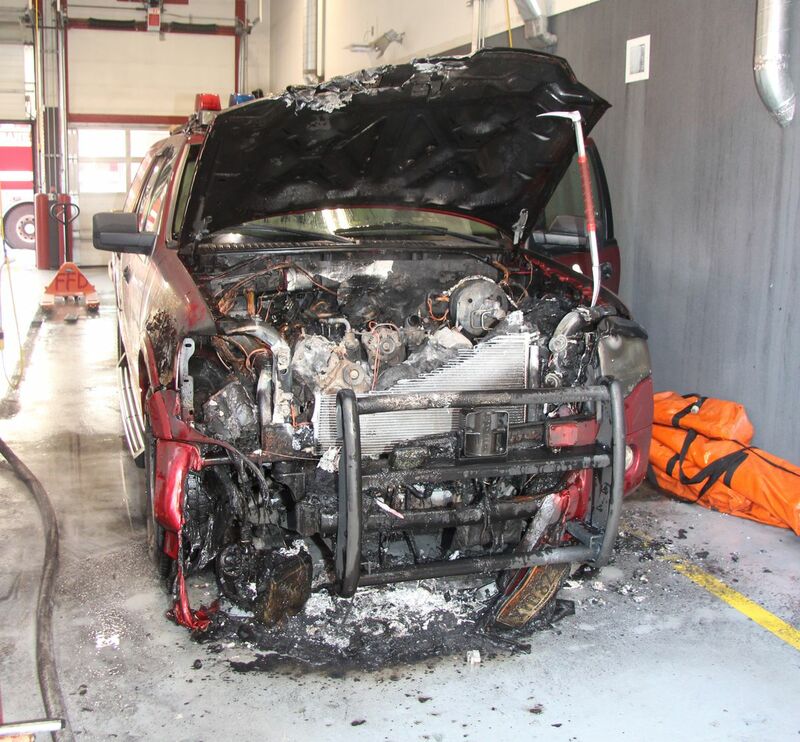 An SUV used as a Battalion Chief vehicle caught fire inside a garage at the Fairbanks Fire Department's downtown headquarters over the weekend, officials said. The Ford Expedition wasn't running when it caught fire around 5 p.m. on Saturday, said Fairbanks city communications director Teal Soden. The cause of the fire isn't yet known. "I think that there's going to be quite a bit of cleanup," Soden said. After the engine caught fire, the building's fire alarms went off, which activated the sprinkler system. The building's alarms are tied into the emergency dispatch system, Soden said, so dispatchers sent a crew from the nearby Aurora fire station. Only two firefighters were at the downtown headquarters when the blaze started. The rest were out on calls. So, the two firefighters readied a fire truck — which needs three people to run it — and waited for more people to arrive to begin combating the fire. Soden said the fire was put out less than half an hour after firefighters arrived from the Aurora station. The burned SUV was a total loss. Nothing else was burned in the fire, but officials were still assessing the extent of the smoke damage on Monday, Soden said. "I do know they're going to be sending a bunch of uniforms to get dry cleaned," Soden said. The vehicle garage bay had filled with smoke, Soden said. One other SUV parked in the garage had its windows rolled down and had suffered some smoke damage, Soden said. Emergency department vehicles are outfitted with additional electronics, but it's not clear whether those were the cause of the fire, Soden said. A deputy fire marshal and the Alaska State Fire Marshal would be investigating, Soden said. No foul play is suspected.